Ever since I saw Sherlock Holmes I've been excited all over again about Jude Law, an actor who was so amazing 10 years ago-- The Talented Mr. Ripley! A.I. !-- but has lately been stuck in a long series of unimaginative roles. And while Sherlock may mean a creative resurgence for Law on the screen, first we're stuck with another role he seems to have taken for the money-- Repo Men. The film's trailer debuted today at MySpace, and you can watch it embedded below behind an age gate. 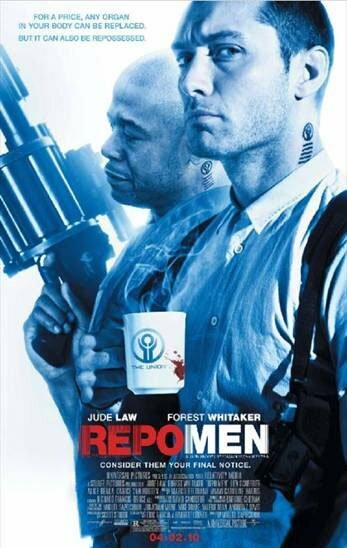 It's set in a future in which you can buy expensive replacement organs, but if you can't pay the bills, repo men like Law's characters will come cut it right out of your body. Of course at one point he's forced to consider the consequences of his job and go on the run from the authority, and this is the kind of trailer that doesn't hide a bit of that plot twist from you. It's kind of like Law was worried for a while there about losing his hair, and then saw Jason Statham become famous and say "Dude, I can do that." Thus, we have Repo Men. And don't be fooled by the presence of Liev Schreiber, as good as it is to see him in anything-- he was Sabretooth, after all. Below is the trailer and the first official image, and below that, the official synopsis. The movie comes out April 2 next year. 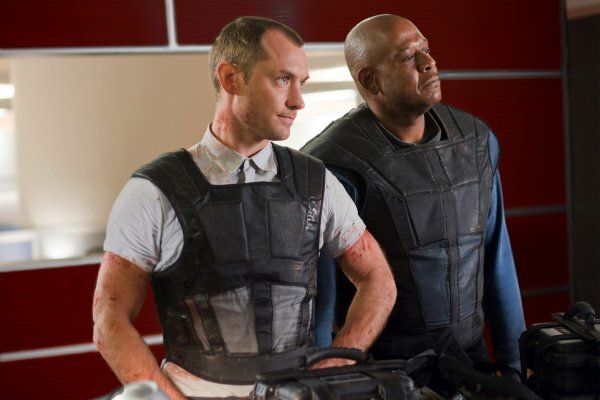 Jude Law plays Remy, one of the best organ repo men in the business. But when he suffers a cardiac failure on the job, he awakens to find himself fitted with the company’s top-of-the-line heart-replacement…as well as a hefty debt. But a side effect of the procedure is that his heart’s no longer in the job. When he can’t make the payments, The Union sends its toughest enforcer, Remy’s former partner Jake (Academy Award® winner Forest Whitaker), to track him down.